Who doesn’t love the Minions? 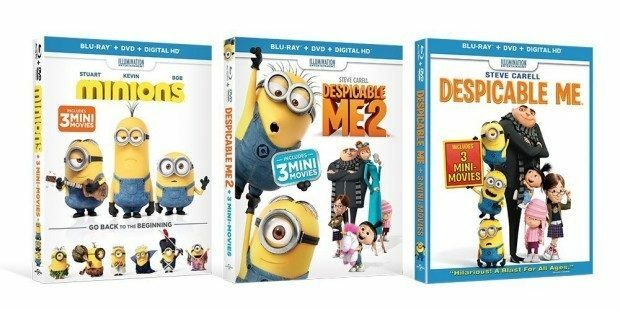 Get the Despicable Me / Despicable Me 2 / Minions [Blu-ray] Bundle for Just $23.99! (Reg. $89) on Amazon! Get yours now while it lasts! Gru, his adorable girls, and the mischievous Minions are back with a cast of unforgettable new characters in the blockbuster sequel to the worldwide phenomenon! Since the dawn of time, Minions have served (and accidentally eliminated) history’s most despicable villains. After their latest explosive mistake leaves them without an evil leader, the Minions fall into a deep depression. With the tribe on the brink of collapse, three unlikely heroes–Kevin, Stuart, and Bob—embark on a journey to find a new big boss.